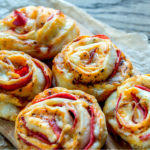 Homemade pizza rolls are a great way to enjoy all of the flavors of your favorite pizza, but in easy to eat, bite size pieces. We began making pizza rolls as a way to make pizza night a little more casual and fun. The kids always loved to help us in the kitchen on pizza night and we wanted to make sure they continued to enjoy cooking. Homemade pizza rolls ready to be dipped in marinara sauce. So we decided to mix things up and see how many creations we could make using their favorite pizza ingredients. It is the perfect meal for a sit down family dinner. Even the pickiest eaters love pizza casserole. And another family favorite – pizza muffin bites. But on the night that we made pizza rolls we had other plans. Our favorite football team was playing at the same time as dinner. So that meant that we had to create something quick and easy to eat. Rolling up pizza dough to slice for pizza rolls. Homemade pizza rolls were the perfect answer! Because we had other typical tailgate foods already prepared for the game, we knew that we didn’t need a make a full meal. So we decided to make this pizza night into an appetizer night. We assembled our pizza without the sauce and rolled it into a tight log. We then cut each log into one inch pieces that were the perfect size for easy handling. It is best to use a serrated knife when cutting the rolls. The jagged teeth are able to cut through the dough without compressing it like a typical knife would. 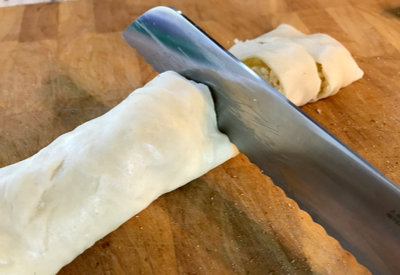 Use a serrated knife to cut your rolls into bite size pieces. We threw them in the oven and in 10 minutes they were ready! We placed them on a large platter with a small bowl of marinara sauce in the center for dipping. They were the perfect addition for pizza and game night! We have made these several times to take to parties, eat as an afternoon snack or for a quick and easy light dinner meal. Dust a large surface with flour and roll out each pizza crust. Sprinkle garlic salt and Italian seasoning directly on each crust. Add the Mozzarella and Parmesan cheeses and diced pepperoni, spreading it within ½ inch of the edges of the crust. 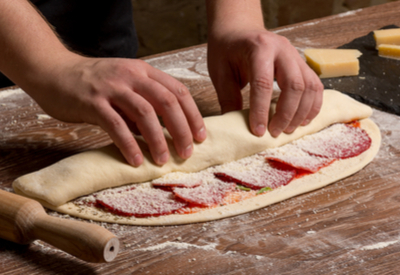 Starting with a short end, carefully roll crust into a tight log. Using a serrated knife, slice each roll into 1-inch sections. 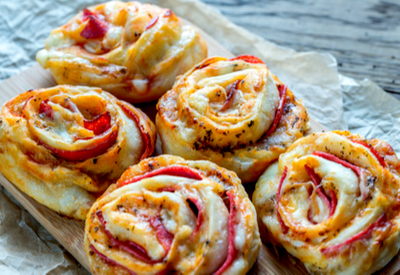 Place pizza rolls on a lightly greased pan and bake for 10-12 mins or until golden brown. Serve immediately with marinara sauce for dipping.